Pete Carroll sure is having fun at his new job as head coach of the Seattle Seahawks. After leaving USC and college scene, you’d think that Pete Carroll would be a little uptight, or perhaps even high strung, as the new skipper with the Seattle Seahawks. But not, Pete Carroll seems to be as relaxed and confident as ever. One example of this comes across via Pete Carroll’s Twitter updates. Seattle Seahawks coach Pete Carroll is supposedly dropping hints on his Twitter account today about just who his team will select in the NFL draft that starts Thursday night, says Seattlepi.com. Carroll is listing song titles and telling his followers to read the clues. You can follow along here along with the coach’s current 386,000 followers. But here’s a couple clues of my own. Eeach of Carroll’s tweets comes with a link to that song’s music video on the Bing.com website. And, yes, Bing is a corporate partner of the Seahawks, who wear their logo on their practice jerseys along with other sponsor relations. “Ring of fire” by Johnny Cash. “Today was a fairytale” by Taylor Swift. “Licking stick” by James Brown. “Superman’s song” by Crash Test Dummies. “Smooth criminal” by Michael Jackson. “Jump around” by House of Pain. “Back door man” by the Doors. “Let the beat build” by Lil’ Wayne. Maybe after the NFL draft is over, someone can take the list of tweets to Pete Carroll and ask him to interpret each one for us. 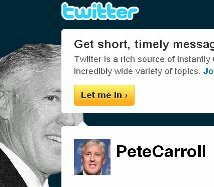 Or maybe, during the NFL draft, we’ll get a clue as to what in the world Pete Carroll was talking (or tweeting) about!